WAVE LED is a magnifier for industrial applications. No knobs to tighten, nothing to adjust – a flexible, self-balancing shade and hands-free neck assembly allows the lamp head to be secured in any position. The fully-enclosed neck design is ideal for environments where foreign object debris (FOD) is a concern. An automatic shut-off feature further ensures energy savings. 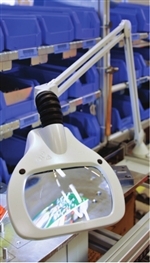 WAVE LED offers shadow-free magnification with light coming from both sides, as well as three-dimensional magnification lighting from the left or right. The 3D-feature is especially welcome when working with circuit boards and similar delicate objects. Lightsource: Two 6W dimmable LED modules. 13W total energy consumed.4600 lux at 11” focal length.CCT: 4000°K.CRI: 80. Body Material and color:Steel arm and die-cast aluminum shade. Fully enclosed neck design. Color:light gray. Optics:3.5-(1.88X) or 5-diopter (2.25X), 6.75” x 4.5” rectangular white crown optical-quality glass lens. Secondary lenses:For additional magnification a secondary 4-, 6-, or 10-diopter STAYS lens can be attached to the primary lens. Power supply:Supplied with cable and plug. Arm technology and movement: Heavy-duty internal-spring 45” or 30” parallel, three-pivot K-arm. Timer and dimming:Step dimming 0-50-100%. 9/4 hour auto shut-off. Mounting:Edge clamp or weighted base.